Our outdoor packaged unit is available as a single or dual stage system that can be designed for 50ºF - 78ºF discharge temperature. A pre-engineered hot water coil is also available for colder climates. Includes S/S internal control panel, tool-less removable service doors, temperature controller, disconnect switch. Multiple filtration and blower options make this unit suitable for all cooking configurations. Self-contained in a streamlined stainless steel cabinet, the unit includes internal control panel, tool-less removable service doors, temperature controller, disconnect switch, integrated air supply fan and DX coil / heat exchanger fitted to your supply air duct. 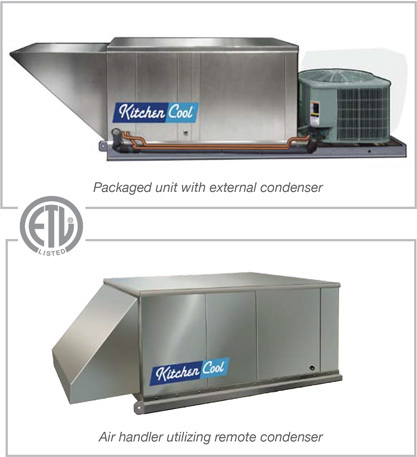 Condensing unit to be piped separately and remotely located (refrigeration piping and start-up by others). The hidden costs of a hot kitchen are loss of productivity and employee turnover!